Although the title conjures images of martial arts films and to me sounds as if it should be about a physical fight, Challenge begins rather conventionally with a dying mother whose son is desperate to get her medicine. However it quickly evolves into a more social drama as Chiranjeevi’s ambitious young entrepreneur Gandhi bets rich industrialist Ram Mohan Rao that he will make 50 lakh in 5 years despite his unemployed status. With Rao Gopal Rao, Vijayashanti and Suhasini Maniratnam along for his journey from rags to riches the film touches on poverty and unemployment, workers’ rights and even industrial espionage as Gandhi rises to his Challenge. 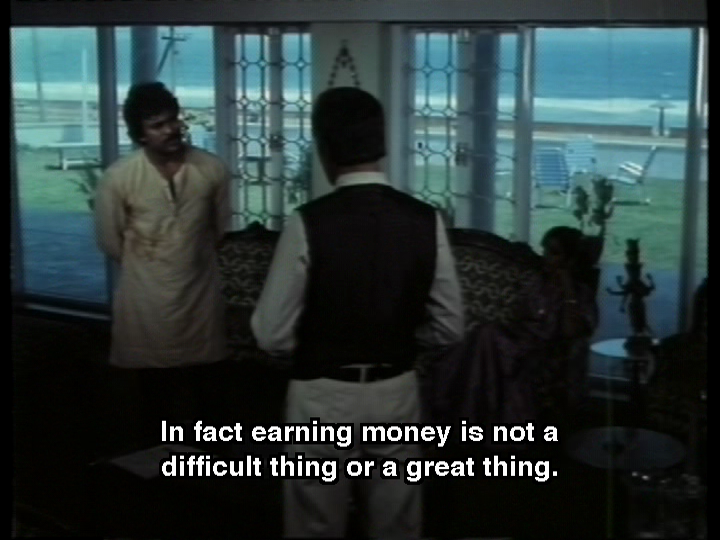 The opening scenes introduce Gandhi as a smart but penniless man who isn’t the type to back down or give up easily. 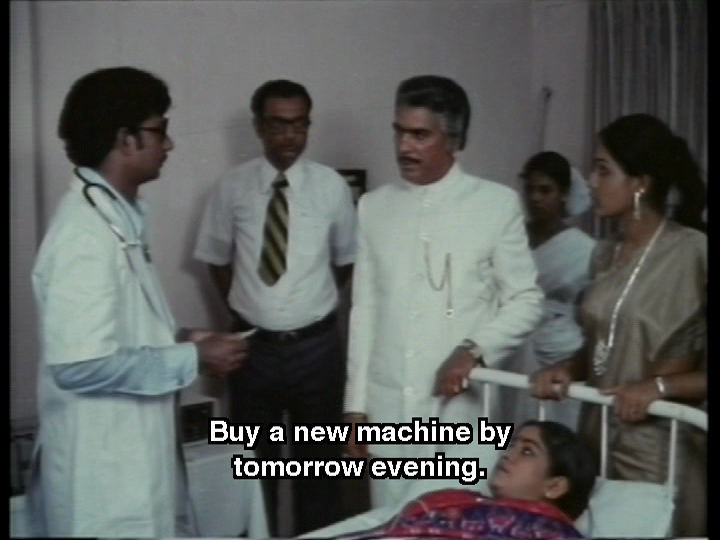 After his mother dies, he uses his intelligence to wheedle money for her funeral from Ram Mohan Rao’s daughter; but for all of his brain power Gandhi isn’t very canny and is easily swindled out of his windfall by the hospital mortuary attendant (Sai Kumar). Although this introduces Mohan Rao and his ‘money can buy anything’ approach to life as well as his beautiful and more compassionate daughter Harika (Vijayashanti), both the money and Gandhi’s speech to the attendant become important towards the end of the film. I haven’t been able to read Yandamoori Virendranath’s original story but the screenplay uses a number of such incidents where apparently trivial events are used to illustrate different facets of Gandhi’s character and their importance to the plot only becomes apparent later on. It’s all very cleverly done, and I did have to go back and re-watch some of these early scenes to pick up on all the details, although perhaps I was just a little distracted by Chiranjeevi’s dancing! Gandhi is a graduate with a first class degree and somehow feels that this means the government owes him a job. In fact he’s quite belligerent about his lack of employment but is rather taken aback when Lakshmi (Suhasini Maniratnam), a girl he has rescued from the river, takes him to task about his attitude. It turns out that Lakshmi is a graduate herself, but rather than complaining about the lack of opportunity is working in a number of different jobs to maintain her independence. Her basic belief is that it’s more important to earn a living than worry about the status of the job and since she has such a practical and pragmatic attitude also sees no problem with offering space in her house to Gandhi. Although Gandhi is initially shocked by the suggestion that he should move in with a single girl, Lakshmi solves the problem by telling him not to think like a woman which quickly stops his objections. This song is another daydream and I do like how Suhasini gets to dance on Chiru’s back! Gandhi ends up applying for a job with Ram Mohan Rao but at the interview is humiliated by the company owner, who is furious that Gandhi sent in his application without a stamp. However Gandhi is just as angry about the trickery used in the job advert and goads Ram Mohan Rao to such an extent that he challenges Gandhi to prove that money is not important. Gandhi vows that he will earn 50 lakh in 5 years and such is his belief that Gandhi will lose, Ram Mohan Rao promises the hand of his daughter Harika in marriage if Gandhi succeeds. Gandhi makes the important distinction that he will make the money legally, although not necessarily honestly and with a coin he has been given by a beggar woman, he begins his rise to riches. However, as he becomes wealthier his attitude changes and he becomes more and more fixated on the money until nothing else, including his relationship with Lakshmi, seems to matter. Indeed it’s not even the money, but rather beating Ram Mohan Rao which becomes the driving force behind Gandhi’s various plans. This then is the real challenge –can Gandhi stay true to the ideas and principles he had as a poor man or will the power of wealth corrupt his values? Lakshmi isn’t the only woman having some issues with Gandhi’s wager. Harika is initially appalled at her father’s pronouncement but as she meets with Gandhi, she gradually falls in love with him (who can blame her!) and she actively starts to help his cause. Since Ram Mohan Rao’s first action was to rip up the contract and set his goons after Gandhi, Harika has plenty of work to do in foiling her father’s plans to ruin Gandhi’s various business ventures. While Gandhi seems determined to win the bet and therefore marry Harika, he is still living with Lakshmi – although the two seem to have a strictly platonic relationship. To add more confusion, Lakshmi’s brother Hanumantha Rao (Gollapudi) and his wife Priyamvada (Silk Smitha) move in with Gandhi and Lakshmi. Hanumantha is secretly working for Ram Mohan Rao, while Priyamvada has designs of her own on Gandhi which seem to involve a rather short red toga and a rendezvous in the desert! Chiranjeevi is riveting as Gandhi and his portrayal of the drive and determination with which Gandhi meets his various challenges feels authentic. Chiru made me believe in every aspect of Gandhi’s moral and physical struggle and I think this is one of his best performances. A. Kodandarami Reddy has done a great job of developing such a complex story and has put a lot of detail into the characters of Gandhi and Laxshmi to make me feel every moment of their struggles. It’s a good story too and although there are a few points that require a little suspension of disbelief, the basic theme echoes stories of personal achievement that do occur in real life. The other lead actors are all excellent. Suhasini is perfect as the strong-minded Lakshmi and she makes the most of her well written dialogues. 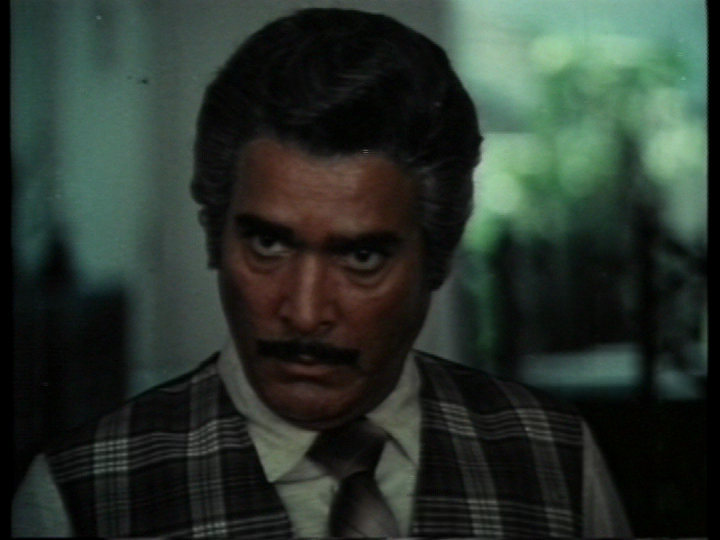 Rao Gopal Rao is suitably villainous as Ram Mohan Rao and although Gollapudi is fairly irritating when he tries to be funny, he doesn’t appear often enough to make it a problem. I surprised myself and recognised a young Rajendra Prasad, who has a small but important role as one of the graduates Gandhi employs as he builds his empire. Vijayashanti looks incredibly beautiful but her character is more than just the glamour element and she too has a strong role to play. The songs by Ilayaraja are another highpoint. Generally they represent fantasies by the various women in Gandhi’s life and the upbeat music and dancing make a good contrast with the more grim reality of the story. 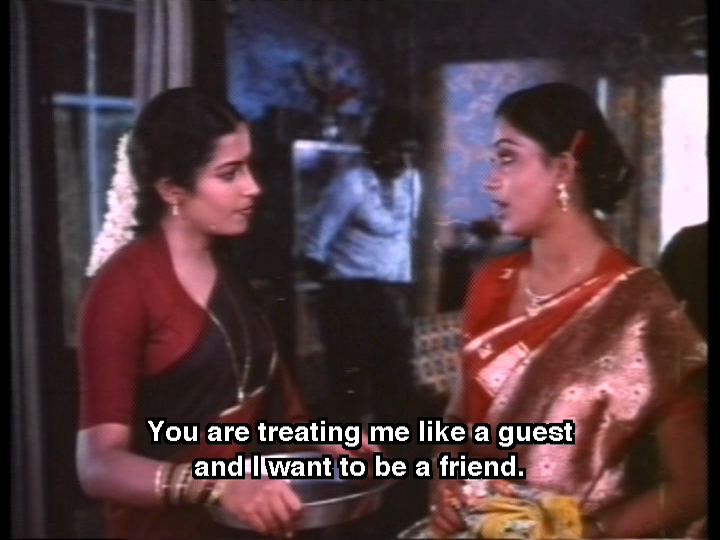 Vijayashanti gets the best costumes and also probably the best line in the film – Mind it! Again it’s a shame that the film isn’t in better condition but at least Challenge is available with subtitles even if they appear at times to be rather literal. I loved this film and it’s a great way to celebrate Megabirthday! Watch for what really is an outstanding performance from Chiranjeevi and his co-stars in a cracking good story. 4 ½ stars. This entry was posted in Tollywood and tagged Chiranjeevi, Chiru, Gollapudi, Ilayaraja, Megabirthday 2012, Rajendra Prasad, Rao Gopal Rao, Sai Kumar, Silk Smitha, Suhasini, Suhasini Maniratnam, Vijayashanti, Vijayshanti. Bookmark the permalink. ← It’s raining (Mega) men! Wow, so it also has the subtitles!That’s really great! 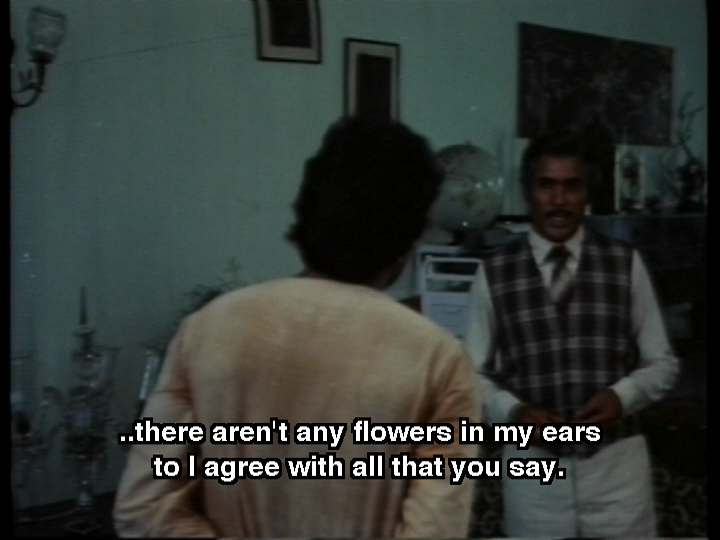 And from my side I’d like to reccomend ‘Nyayam kavali’- one of the Chiru’s early flicks, where he plays antihero role and the movie is heroinocentric one, I can say about woman rights (I was so shocked 30 years ago there were such strong, bold movies!) Movie can be found on YT, no subtitles, but anyway really worth seeing. Thanks for the recommendation 🙂 I will have a look for it on YT. I’m quite thankful that this DVD had subtitles – I don’t think it would have had the same impact without understanding the dialogue. It’s all very well written (as far as I can tell from the subtitles anyway) and there were some great speeches in there. I have nothing intelligent to say but must comment that Silk’s song is fascinating! Love among the mole people? What exactly do we think is going on in those molehills? Also, did you figure out what Chiru’s underskirting is? 90s Bollywood taught us you should wear bike shorts with a skirt like that, yet I did not see any spandex but neither was I flashed. SCIENCE! Aah Beth – I was initially very disturbed by those people popping up from the holes in the ground but it’s hard to focus on them when Chiru is dancing around in such a very short toga! This is such a good film and Chiru suits the character perfectly. Although I do like him in the more masala films too, this just proves that he really is a fantastic actor. 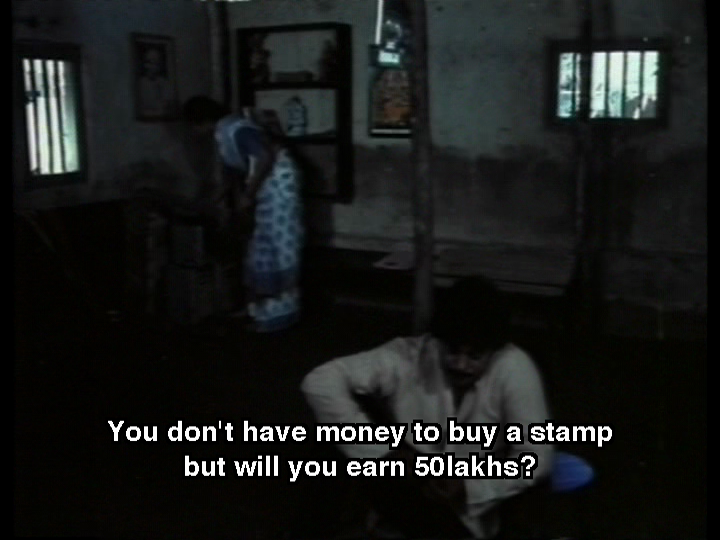 Those dialogues between Gandhi and Lakshmi in the factory are brilliant! I’d like to read the book too – it’s an interesting story. One of the best combination of Chiru + Yandamoori. I was impressed by how Chiranjeevi brings more realistic touch to the character. Good choice for celebrating Chiru’s birthday! Thanks! I was really impressed by this film and totally loved it 🙂 I think the way Chiranjeevi’s character evolves is brilliantly done – it’s a clever piece of writing and a fantastic performance by Chiru.